Posted by jayocallahan in Jonesborough. 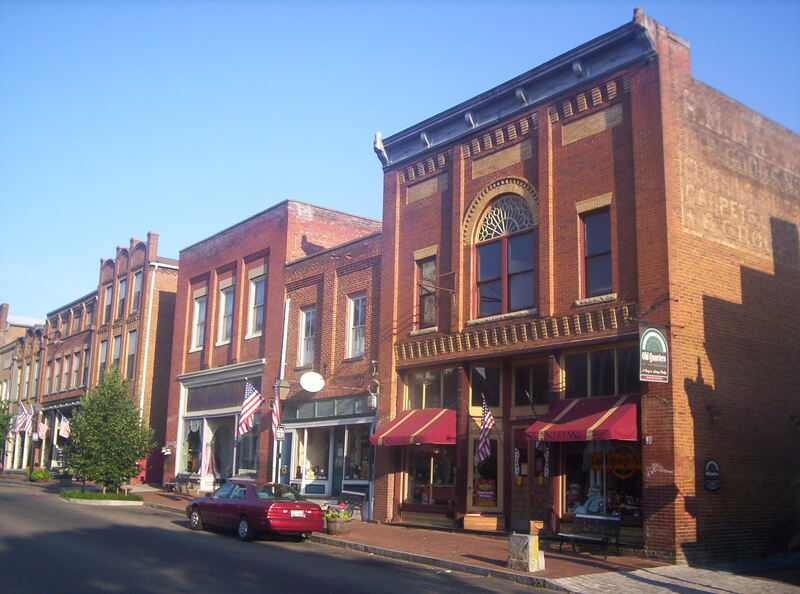 Creating Main Street, Jonesborough was like climbing a great, rocky mountain during a fog, which turned into a rainstorm, which became a sleet storm and then a ragingly hot day, which parched me and dizzied me so that I started going backwards for days and weeks. Main Street, Jonesborough was something I dreamed about and one of the dreams was so vivid I was totally lost in the dream. In the dream I was in a crowded tavern and thought everyone must have been drinking because they spoke so oddly. There must have been a hundred people laughing and talking in the tavern. I could hear horses and carriages going by outside. I could hear the sound of market sellers shouting outside even though it was night. Then I thought, well these must be actors acting some Elizabethan drama and they’re still in costume because they have to do a scene later on. There were lanterns all about but no sign of electricity anywhere. Several colorfully dressed men were smoking pipes and I noticed they were clay pipes and a few were ornamented with gold. I managed to find a table in the rear where there was a man in his forties sitting, nodding to himself. The man had a short red-brown beard; he was balding and had warm alert green eyes. He looked at me and said, “I’ve had more than more.” He laughed and raised his hand for another ale and then called, “Two, two ales.” A waitress dressed as a serving maid brought two ales. She was tall, black-haired and very pretty but when she smiled I saw she was missing a tooth. “You look worn,” he said. “Tell me,” he said. His voice was strong and rich. Perhaps he’s a singer or maybe an actor I thought. “You just needed to relax,” I said. “Well if it’s Lear you’ve done you must be exhausted,” I said. And he turned, “Well thank you, thank you. I hope it plays well. One day I hope to drop the pen and go back to Stratford and put my feet up. The dream ended but the voices of the tavern continued through the night. I wish I could have told him the whole story. Looks like eventually you climbed up out of the fog and through the clouds to the highest peak where like jumping mouse you can see with the eyes of the eagle. I like this dream alot and I know I am going to love the story. If anyone could entertain the author of King Lear it would be you my friend. Looks like you climbed right out of the fog and clouds right up to the highest peak where like Jumping mouse you can see through the eyes of the eagle. If anyone could entertain the author of King Lear it would be you my friend. I can’t wait till I get the opportunity to sit back and let you take me on this trip to main street with you. Clearly this is a dream that doesn’t want to die with you! Sometimes one must continue when all else seems to point elsewhere!